Our poor boy Jasper has been having some troubs recently. Today was our second visit to the vet in as many weeks. We didn't sleep most of last night, concerned about Jassie's shallow, labored breathing, all night long. Our good eater hasn't been eating much, leaving kibbies behind in the bowl, no matter the enticements offered. And even though Jas clearly wanted to go, I cut our morning walk short; even the slightest trot would cause him to cough and weave. Heart-breaking, really. On top of that, I swear he has been giving me this look for the past week or so, head held kind of low, direct stare into my eyes that he hasn't done before. Like he's asking me for help. I know that's probably total projection, but I swear this is a new intent gaze he's never directed at me before in our 13 years 8 months together. I was about to leave for work, with the plan of calling the vet at 9. I chanced it and called them from the driveway at 8:20, and lo and behold, they had a 9am slot for us. All manner of blessings on the staff and doctors at our vet clinic. They are unfailingly sweet and kind, baby-talking Jasper like there's no tomorrow. One physical exam, two chest x-rays, some bloodwork, 1 shot of antibiotics and 1 new prescription later, Jasper is home and resting on his pillow, still breathing with a great deal of effort. The verdict: our little sweetheart has fluid in his lungs. 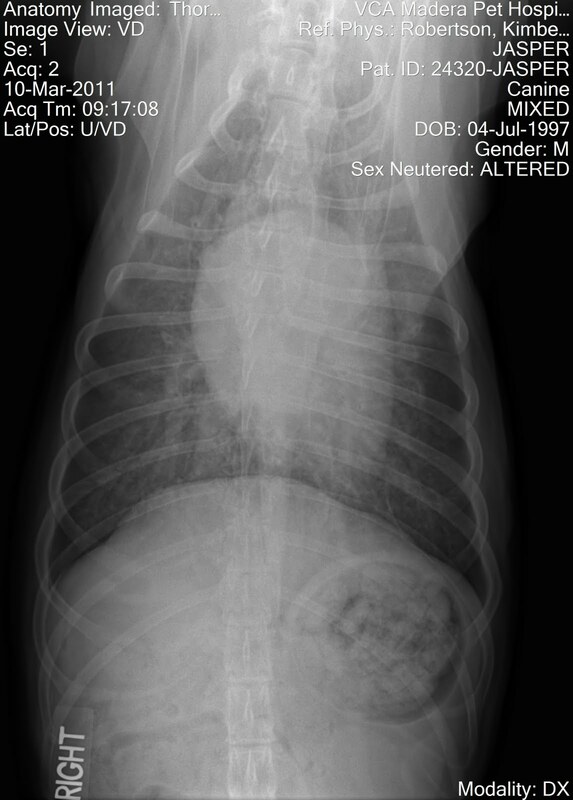 If you look closely at the x-ray above, you can see it: where he should have nice dark lungs filling out his rib cage, there is a smokiness -- that's the fluid. No wonder breathing has been such an effort, pobrecito! The question is why, of course. 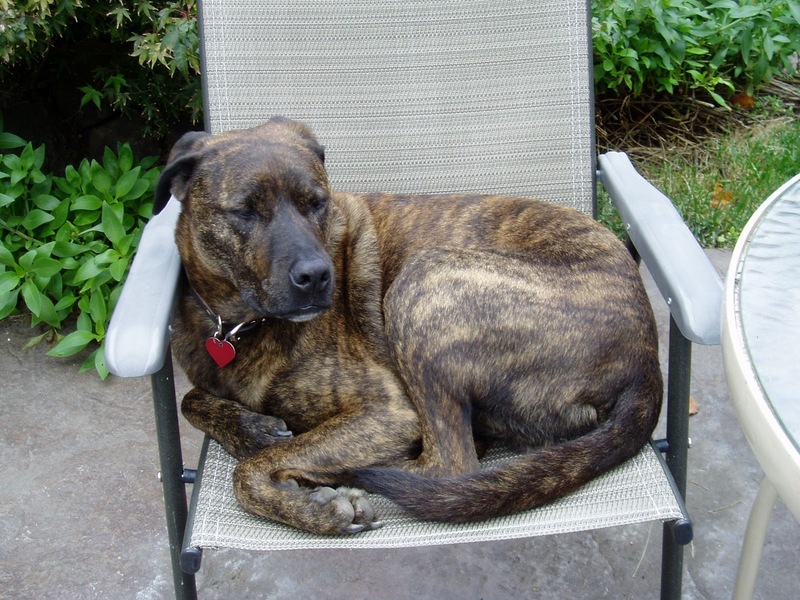 Jasper has a mild heart murmur, so immediately we go to the possibility of heart failure. This is not unusual in older dogs, especially those with murmurs, and was the very thing that drove us to the vet two weeks ago (after my Googling turned up this alarming possibility). The good news is that his heart is not enlarged, looks fine, and really on the scale of 1 to 6 on which they grade heart murmurs, his is only a 2. Mild. Heart failure is treatable not curable. We could keep him comfortable with daily medication. 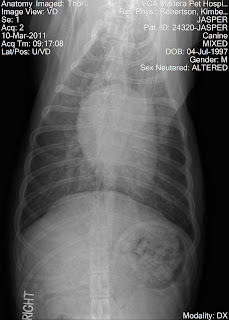 The other most likely possibility is pneumonia, something else that's common in older dogs. But naturally, the thermometer didn't indicate a fever, which you'd expect with pneumonia, though not always. Antibotics would clear it up. Possibilities eliminated: cancer (phew), heart worm disease (phew). Still nothing's clear-cut at the moment, except that our boy is struggling for air. Most likely it's either heart failure or pneumonia. Yes, there are some other options, but those seemed less likely. By later this afternoon, I will have heard from the vet re the blood panel they're running right now. That'll help narrow things. The radiology report tomorrow morning will tell us more, perhaps even something definitive. By later today or tomorrow morning, we are hoping to see some improvement in his breathing: either the antibiotics will start doing the trick on the pneumonia, or the other meds for the heart failure will have helped to move the fluid from his lungs so he can get full breaths. Either way, he should be feeling better. And that's all I really want: for our sweet Jassie to be ok, to be able to fill those capacious lungs of his with air and keep that big, bold heart beating strong as ever. Jas, in better days, curled up in a garden chair. Love! I really doubt that what you saw in Jaspers eyes was from your anthropomorphising him. The amount of communication from eyes and facial expression (in both directions) is truly amazing. Hoping that Jas's antibiotics do the trick. Hang in there Jas!